The town of Suzhou, famous for its gardens and canals, was also one of the main cultural centers in China, attracting many painters, calligraphers, poets, musicians and other talented individuals. Their pursuits and interests form the main subject matter of the group of acclaimed snuff bottles intricately carved from agate and jade in a style unique to the workshop associated with Zhiting, a famous jade carver from the area. Zhiting was one of the few jade carvers who signed his wares with the intention of establishing artistic identity. The first of these artists to do so was Lu Zigang, who probably inspired Zhiting, although the former worked two centuries earlier. 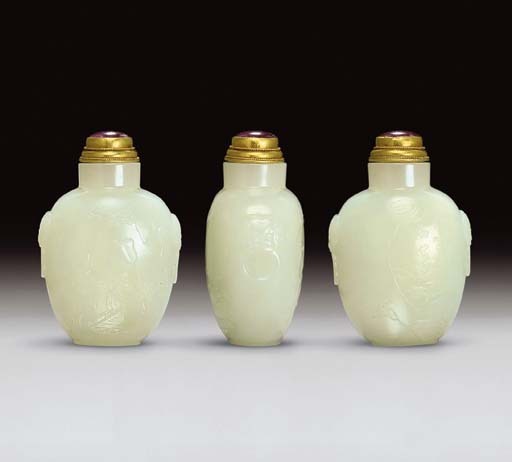 Extant signed works by Zhiting are all small, being either pendants or snuff bottles, and a similar style of carving links the jade and quartz pendants to the snuff bottles. The name "Zhiting School" has been applied to this particular group of carvings from Suzhou. James Watt had originally attributed Zhiting to the Kangxi period based on the styles of the plaques and pendants. However, the existence of a fairly large number of snuff bottles which appear to be stylistically later, suggests that if he was active at all during the Kangxi reign, he worked into the Qianlong period, and that the school or workshop style he inspired continued into the second half of the nineteenth century. The present example is carved in the low-relief style associated with earlier Qing jade carvings from Suzhou, and may be among Zhiting's earlier works, although evident here are many features of the later, more fully developed, high relief carving of the school, such as the typical cloud motif, the rockwork and the relief inscription. For a discussion on the School of Zhiting, see Moss, Graham, Tsang, A Treasury of Chinese Snuff Bottles, Vol. 2, Quartz, no. 366. Hugh Moss informed Mary Margaret Young of the existence of nearly twenty known snuff bottles signed by Zhiting. Another bottle signed by Zhiting is in the Bloch Collection, the Bloch "Deer and Pine" nephrite snuff bottle (Moss, Graham, Tsang, A Treasury of Chinese Snuff Bottles, Vol. 1, Jade, no. 122), one carved with a seated figure and a deer, inscribed in clerical script in relief and sold in these rooms, 3 June 1993, lot 328, and a third signed example of dark grey and greyish-white nephrite carved with a dragon in relief is in the Snowy Peaks Collection, and illustrated by Robert Hall, Chinese Snuff Bottles XI, The Snowy Peaks Collection, no. 81. It is interesting to note the unusual use of the mask-and-ring handles on a Suzhou jade carving not made for the Court. These handles were a typically Courtly feature and standard on northern snuff bottles, but were less frequently used on southern products for a non-Imperial market. Their use suggests the possibility that although the bottle was carved in Suzhou, it was intended for a Northern audience. The six-character inscription reads, Nangong baishi, Zhi Zhai which can be translated as "Nan Gong worshipping a stone, Orchid Studio". Nan Gong was the sobriquet for the Northern Song artist and minister Mi Fu (1051-1107). The story goes that he was so overawed by one particular strange stone, that he donned his official robes, took his hu in his hands, and bowed respectfully to it, addressing it as "Elder Brother".